Objective: to examine the context in which VM was written and what experts and even Rabindranath Tagore had to say about it. 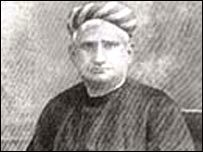 Vande Mataram was composed by Bankim Chandra Chatterjee in a highly Sanskritized form of the Bengali language. The song first appeared in his book Anandamatha, published in 1882 amid fears of a ban by British Raj, though the song itself was actually written six years prior in 1876. The central plot in the book Anandamatha moves round a band of sanyasis, called santanas or children, who left their hearth and home and dedicated their lives to the cause of their motherland. They worshipped their motherland as the Goddess Kali. This aspect of the Ananda Math and the imagery of Goddess Kali leave no doubt that Bankimchandra's nationalism was Hindu rather than Indian. This is made crystal clear from his other writings which contain passionate outbursts against the subjugation of India by the Muslims. To quote R C Majumdar a well known historian "Bankimchandra converted patriotism into religion and religion into patriotism." Anti-Muslim references are spread all over the work. Jivananda (a character in the book) with sword in hand, at the gate of the temple, exhorts the children of Kali: "We have often thought to break up this bird's nest of Muslim rule, to pull down the city of the renegades and throw it into the river - to turn this pig-sty to ashes and make Mother earth free from evil again. Friends, that day has come." The use of the song 'Vande Mataram' in the novel is not adventitious, and it is not only communal-minded Muslims who resent it because of its context and content. M.R.A. Baig's analysis of the novel and the song deserve attention. 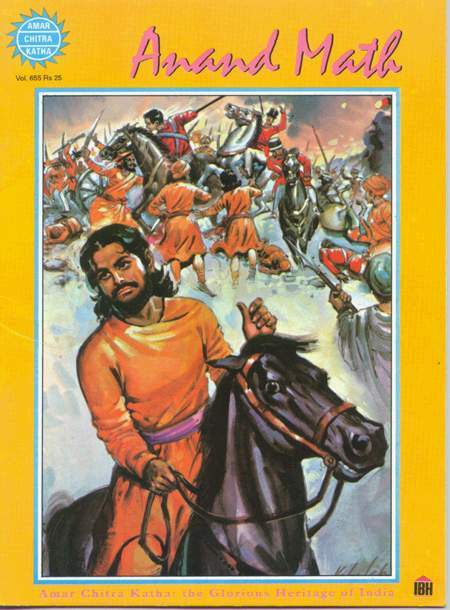 "Written as a story set in the period of the dissolution of the Moghul Empire, the hero of the novel, Bhavananda, is planning an armed rising against the Muslims of Bengal. While busy recruiting, he meets Mahendra and sings the song 'Bande Mataram' or 'Hail Mother'. The latter asks him the meaning of the words and Bhavananda, making a spirited answer, concludes with: 'Our religion is gone, our caste is gone, our honour is gone. Can the Hindus preserve their Hinduism unless these drunken Nereys (a term of contempt for Muslims) are driven away?'... Mahendra, however, not convinced, expresses reluctance to join the rebellion. He is, therefore, taken to the temple of Ananda Math and shown a huge image of four-armed Vishnu, with two decapitated and bloody heads in front, "Do you know who she is?" asks the priest in charge, pointing to an image on the lap of Vishnu, "She is the Mother. We are her children Say 'Bande Mataram'" He is taken to the image of Kali and then to that of Durga. On each occasion he is asked to recite 'Bande Mataram'. In another scene in the novel some people shouted 'kill, kill the Nereys'. Others shouted 'Bande Mataram' 'Will the day come when we shall break mosques and build temples on their sites? Rabindranath Tagore who composed the song Jana Gana Mana adopted as India's national anthem in his letter to Subhas Chandra Bose (1937) wrote, "The core of 'Vande Mataram' is a hymn to goddess Durga: this is so plain that there can be no debate about it. Of course Bankim does show Durga to be inseparably united with Bengal in the end, but no Mussulman [Muslim] can be expected patriotically to worship the ten-handed deity as 'Swadesh' [the nation]. This year many of the special [Durga] Puja numbers of our magazines have quoted verses from 'Vanda Mataram' - proof that the editors take the song to be a hymn to Durga. The novel Anandamath is a work of literature, and so the song is appropriate in it. But Parliament is a place of union for all religious groups, and there the song can not be appropriate. When Bengali Mussulmans show signs of stubborn fanaticism, we regard these as intolerable. When we too copy them and make unreasonable demands, it will be self-defeating." In a postscript to this same letter Rabindranath says: "Bengali Hindus have become agitated over this matter, but it does not concern only Hindus. Since there are strong feelings on both sides, a balanced judgement is essential. In pursuit of our political aims we want peace, unity and good will - we do not want the endless tug of war that comes from supporting the demands of one faction over the other." 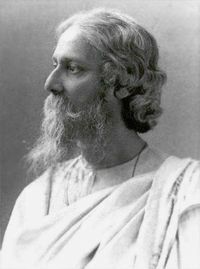 (Letter #314, Selected Letters of Rabindranath Tagore, edited by K. Datta and A. Robinson, Cambridge University Press ). These are facts. Analyse and absorb them. Here is a great link to Anadmath images in AmarChitra Katha comics. Another link to A G Noorani's article on VM published in Frontline of January 1999. My next post InshaAllah on the same topic. Posted by Arshad on Thursday, August 31, 2006. Well written. Getting a sense of the roots and origins and its historical relevance is extremely important when debating a topic- especially the controversial ones like VM. Good effort on your side to bring those into perspective.